Located southeast of Ho Chi Minh City, close to where the Saigon River meets the South China Sea, the low-lying Can Gio island houses a UNESCO Biosphere Reserve. This is an important natural wetland with attractions like Monkey Island, Rung Sac Military Base, Vam Sat Salt-Marsh Forest Ecological Tourist Center, and a crocodile farm. The road to Can Gio is relatively traffic-free and makes a fun scooter trip if you have the appropriate licenses, insurance, and experience; after all, Vietnam’s roads are no place for beginners. If you prefer less ambitious transportation, fast ferries run to the region from central Saigon. Alternatively, you can arrive in style with a speedboat tour from the heart of Saigon or travel to the island on a minibus then transfer to a boat. Can Gio tours typically include a mangrove cruise, a visit to the macaques on Monkey Island, and a trip to the crocodile farm; a few also focus on the migrating birds. Some Can Gio Mangrove Biosphere Reserve tours stop at a riverside market or Can Gio Museum on route to the reserve. Can Gio Mangrove Biosphere Reserve is a great destination for lovers of nature; look for small-group tours that focus on the wilderness, not the farms. The mangrove forests attract mosquitoes, so bring plenty of bug spray. With monkeys, crocodiles, and mangroves, Can Gio can make a great day trip with kids. Be sure to bring water, sunscreen, and snacks. Around 27 miles (60 kilometers) southeast of Ho Chi Minh City, Can Gio island is most easily reached from Saigon by the Greenlines ferry, although schedules make that route most suitable for visitors who want to stay overnight. Assuming you want to join a boat trip on arrival, book a Can Gio tour that includes door-to-door round-trip transfers. You can visit Can Gio Mangrove Biosphere Reserve at any time of year, but if migrating birds are part of the attraction, you should come during the breeding season (November until May). Among the myriad species you can hope to see are spot-billed pelicans and painted storks. Bizarre shrubs that thrive in brackish coastal waters, mangroves create their own unique ecosystems, and the Can Gio biosphere is home to over 200 species of fauna. While the animals you’re most likely to see on a Can Gio tour are macaques, crocodiles, fruit bats, and (in season) migratory birds, the island is also home to king cobras and fishing cats. Enjoy a full-day eco-adventure by luxury speedboat, traveling from Ho Chi Minh City to Can Gio Biospere Reserve with an expert guide. Cruise through the canals of the Mekong Delta en route and visit a vibrant riverside market. In the UNESCO-listed Can Gio Biosphere Reserve, discover Giant Bat Lagoon by rowboat, trek through mangrove jungle, see a crocodile reserve, observe gibbons and monkeys, and enjoy bird watching. Lunch and light breakfast are included, and numbers are limited to 14 participants, ensuring an informative small-group experience. Delve into the vibrant flora and fauna of Can Gio Biosphere Reserve, a chemically damaged expanse that now teems with life, on a full-day tour from Ho Chi Minh City. Start off by exploring the Vam Sat Ecopark by boat or canoe to see bird's nesting as well as a crocodile swamp accompanied by an expert naturalist guide. Ascend to the summit of Tang Bong Tower to capture sweeping views of the surrounding and catch a glimpse of Rung Sac Guerilla Base. Then enjoy a delicious lunch before heading to Monkey Island, the Can Gio Museum, and and the Mangrove Forest Park. 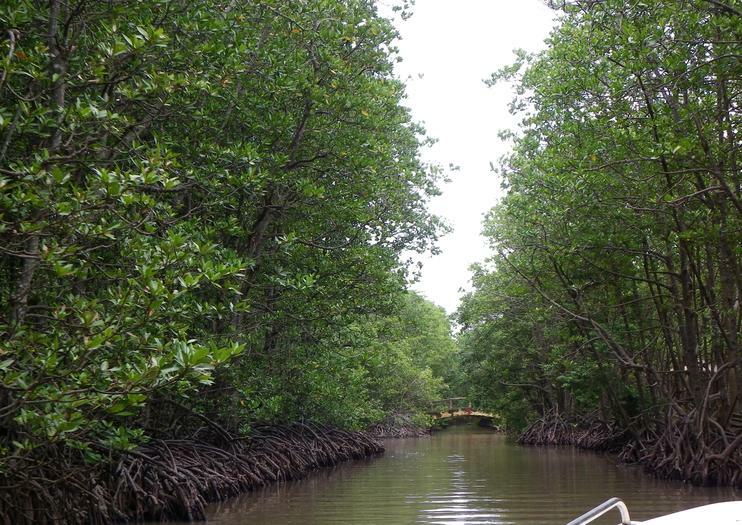 An eco-adventure Can Gio forest tour to the mangrove forests of the Can Gio UNESCO Biosphere Reserve.Your scenic speedboat journey will take you from the heart of Saigon to the dense riverside jungles of idyllic Can Gio, via the verdant green canals of the Mekong Delta. This tour is available for group from 2 people and the maximum of 10 people. Discover a UNESCO Biosphere Reserve and mangrove forest just 25 miles (40 km.) from Ho Chi Minh City, and spend the day exploring Vietnam’s wildlife and natural beauty. This full-day, small-group tour of Can Gio from Saigon includes hotel pickup and drop-off, a boat trip along a Can Gio river, entrance fees, and lunch. Can Gio mangrove forest with a very special environmental condition is a combination of aquatic and terrestrial ecosystem as well as a mixture of freshwater and saltwater ecosystem. The forest area is 75,740 hectares, with over 150 botanical species. With the itinerary of many exciting activities, 102 Travel guarantees that Private Can Gio 1 Day Tour will be an interesting choice for nature lovers on weekends who want to relax and immerse themselves in nature.